Cold weather can be rough on your hardwood floors for multiple reasons, including salt, snow and water, and change in temperatures. You can still host house-full holiday parties while protecting your hardwood floor with these tips. Salt can cause irreparable floor damage, especially to hardwood floors. 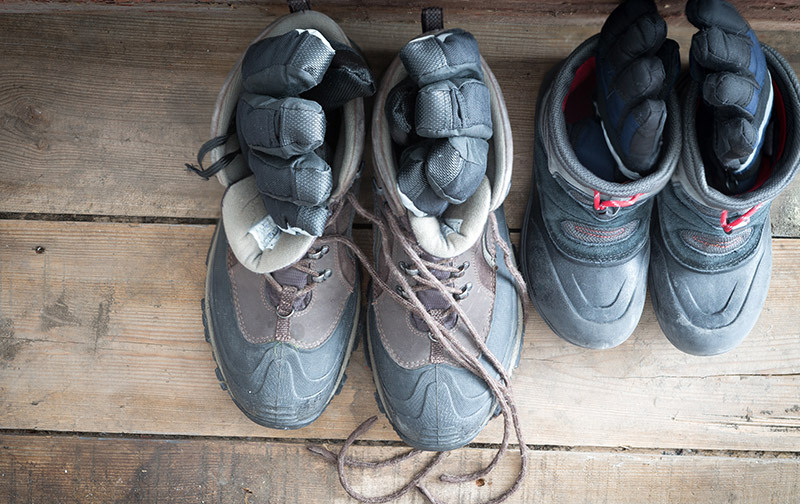 Keep a shoe rack near all entryways and ask your guests to remove their shoes when entering the house. This rule also helps keep germs off your floors. Place doormats and rugs at both the inside and outside of all entryways to your house. Keeping a rug at each door—both inside and outside—to your house will help catch salt, dirt, and snow tracked to the door by guests. Having two rugs or doormats catches debris in two places instead of one before entering your house. Avoid rubber-backed or non-ventilated rugs, as they can damage hardwood floors. Clean up melted snow and salt before it dries. Keep towels or paper towels on hand at all entrances of your house to ensure quick and easy cleanup of snow and salt tracked in from your pets, guests, and kids. Pets don’t wear shoes, and they sure don’t wipe their own feet. The change in temperature during the winter months causes the water inside the wood to contract, ultimately causing the wood to shrink. In warmer weather, the wood will go back to its normal size. The continuous temperature changes cause wood to warp over time, an effect that can’t be undone or fixed. Use a humidifier during the winter to keep your hardwood temperature stabilized. This will help preserve the hardwood long term. Be sure to keep the area around your humidifier dry from standing water. Use a broom or dust mop to sweep up loose dirt and salt in high traffic areas daily. The goal is to keep as much dirt and salt off the floor as possible, so always have a dustpan and broom on hand to clean up small areas quickly. Hardwood flooring is a long-term investment in your home, and proper floor care will guarantee long-term satisfaction with your hardwood floor choice.